Sony love a surprise product announcement - they did it last March 2016 with the RX10 III, so it was little surprise when we were scrambling around our desks at 3pm on the 12th September to watch the live launch for the new Sony RX10 IV! Go straight to our specifications comparison table. 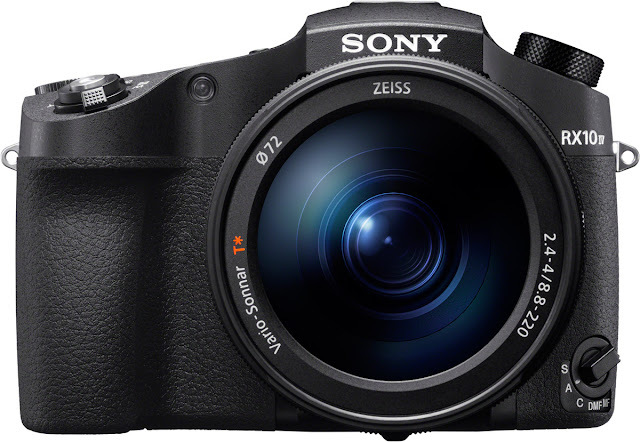 When the Sony RX10 III launched in March 2016 it was more of an alternative to the RX10 II as opposed to a direct replacement product, meaning that when comparing the two, the differences weren't as obvious as with an entirely new model. The same could be said when comparing the Sony RX10 IV with its predecessors, the RX10 III and RX10 II, however there are certainly some obvious differences between the three cameras that make them distinct from each other. As with their Alpha a7 series, RX100 series and almost any other camera range, really, Sony are in the habit of keeping the preceding camera in the lineup in production rather than immediately killing it off when the new version comes out, as other camera manufacturers tend to do. This means that, right now, you can buy all four iterations of the RX10, from the original to the latest RX10 Mark IV. At first glance, the RX10 IV is identical in outward appearance to the RX10 III, which will be reassuring to anyone upgrading from a previous model. There was a much more noticeable difference between the RX10 II to the RX10 III - most obviously in the much longer lens, but also a redesigned grip and new shape to the body. However, it's on the inside where all the changes have been made between the RX10 II to the III to the IV. On the face of it, image quality hasn't changed much between the RX10 Mark II to the latest RX10 IV, with all three cameras sharing the same megapixel count (20.1 effective), and using the same 1.0-type EXMOR RS CMOS sensor, with all three being powered by the famed Bionz X image processing engine. Some may look at this and wonder why Sony haven't added more pixels with each follow-up model, but there's a good reason for this, and it's the same reason why the Sony a7S II only has 12 megapixels. The answer is that they simply don't need more. Camera manufacturers worked out a couple of years ago that adding more megapixels doesn't always equal better quality images, especially with smaller sensors like the 1.0-type. So in the case of the RX10 series, 20.1 megapixels is plenty; any more and image quality like noise would be sacrificed for the sake of resolution. However, with improvements made to the Bionz X image processing engine from previous models, the processor in the RX10 IV offers faster continuous shooting of up to 24 frames per second, whereas the RX10 III and RX10 II were only capable of 14fps. When the RX10 II came out in July 2015 it introduced 4K video recording into the RX10 series, and at the time this was a huge deal. As time goes on, we photographers expect more and more, so it's no surprise that the RX10 III and newest RX10 IV also record ultra high definition 4K video. There haven't been any major advancements here since the RX10 II was released, but as with megapixel count, there doesn't necessarily need to be. The ability to shoot Full HD 1080p video at 120 frames per second to shoot slow-motion video, and ultra-high definition 4K video at 30p or 25p is exceptional for a compact bridge camera like the RX10 IV, and there's not really any advancement to be made here, so Sony have kept the tried and tested tech. So while still image quality and video image quality have remained the same between the RX10 Mark II, Mark III, and Mark IV, the autofocus system is where Sony have introduced new tech and significant improvements. While the RX10 II and RX10 III share the same 25 point Contrast Detection autofocus system, Sony have introduced a Hybrid AF system into the RX10 Mark IV consisting of a 315 point Phase Detection system and 25 point Contrast Detection system. Focusing speed is just as important as focusing accuracy, so whereas the RX10 II and RX10 III were able to lock on focus in just 0.09 seconds, the RX10 IV has smashed this record and brought the focusing speed down to just 0.03 seconds, less than the blink of an eye. This puts the RX10 IV in a class above its predecessors, the RX10 III and RX10 II, with faster and more accurate autofocus than anything that came before it. The 315 point Phase Detection autofocus system in the Mark IV covers approximately 65% of the entire image area of the image sensor, offering widespread and dense coverage of AF points. The original RX10 and RX10 II shared the same Zeiss Vario-Sonnar T* telephoto zoom lens with a focal range of 24mm to 200mm with a constant aperture of f/2.8 across the zoom range. 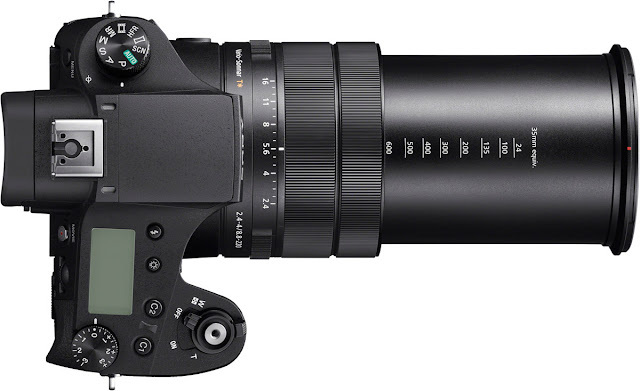 From the RX10 III, Sony have brought a vast improvement to the focal reach of this camera, with the RX10 III and the latest RX10 IV offering a focal range of 24-600mm with an f/2.4-4 aperture. A physical addition to this whopping lens between the RX10 II and RX10 III is a triple lens ring, enabling you to adjust zoom, aperture and focus with the twist of the dial - a nice improvement on the single focusing ring found on the other RX10 models. Another new button is the focus hold button, ensuring that focus distance is kept when pressed - alternatively you can choose to use this as a custom function button and assign it to do something else. The 24-600mm f/2.4-4 aperture lens in the RX10 IV and III is also a high quality Zeiss Vario-Sonnar T* but is now constructed of 18 elements in 13 groups with 6 aspheric elements including an AA lens, whereas the RX10 II 24-200mm lens was constructed of 14 elements in 11 groups with 7 aspheric elements including an AA lens. This lens also differs in the sense that it has a variable maximum aperture range of f/2.4-f/4 rather than the constant f/2.8 adopted in last year’s addition to the market. This is understandable given the effective 400mm extra focal length and is still an impressive maximum aperture at the far scale of the focal range. This means that while the RX10 II only offered an optical zoom of 8.3x, the RX10 III and RX10 IV offer an optical zoom of 25x. Camera manufacturers like Sony worked out a few years ago that a 3.0 inch screen was the Goldilocks size for modern compact digital cameras, so the screen on the RX10 series hasn't changed between the RX10 II and RX10 IV in terms of its size. While the size of the screen on the RX10 IV is the same as the RX10 III and both are tiltable up to 109 degree upward and 41 degrees downward, it is now also a Touchscreen - the first for an RX10 series camera, and introduces Touch Focus and Touch Pad functionality. The Touchscreen on the RX10 IV is also higher resolution than its predecessors, at 1,440,000 dots compared to 1,228,800 dots in the RX10 III and RX10 II. The XGA OLED 0.39-type 2,359,296 dot electronic viewfinder has stayed the same between the RX10 II, to the RX10 III and into the latest RX10 IV. From a usability point of view, the addition of NFC and Wi-Fi to digital cameras has been one of the biggest and most noticeable leaps forward in recent years. So while the RX10 II and RX10 III shared the same Wi-Fi and NFC connectivity, the RX10 IV has introduced Bluetooth (4.1 - 2.4GHz band) into the camera for added functionality and increased usability including the ability to add location information from your phone into your photos and easy and quick sharing on-the-go. Despite the extra demands from the RX10 II to the RX10 III battery life increased to 420 shots from expected 400 shots in the RX10 II; however, with the extra features and added functionality in the RX10 IV, battery life has taken a bit of a hit with an expected life of a single charge back down to 400 shots. The RX10 IV is the same weight as the RX10 III at 1095 grams, but both are heavier (thanks mostly to the larger lens) than the RX10 II which is only 813 grams. The are some big physical changes between the RX10 II and the RX10 III, with minor changes to the internal workings and image quality, which makes the primary difference between the two cameras the added reach from the significantly longer focal length lens. However, while the RX10 III and RX10 IV share broadly the same physical appearance (other than the addition of a touchscreen on the rear), the main changes are to the inside, with vast improvements made to the speed and accuracy of the autofocus system, increased continuous shooting of up to 24 frames per second, and added connectivity with Bluetooth. Whichever camera you opt for, whether its an RX10 II, RX10 III or the very latest RX10 IV, you'll have a camera that shoots stunning 20.1 megapixel still images, ultra high definition 4K video at 30p, and steady and shake free shots with a phenomenal zoom range. The Sony RX10 II is available to buy now at Park Cameras both in store & online, as is the Sony RX10 III. The new Sony RX10 IV will be available to pre-order at Park Cameras shortly. If you'd like any more information about any of these cameras, please call our expert team on 01444 237070 or drop us an email at sales@parkcameras.com and we'll do our best to help you out. The RX 10 IV is easily the winner in the bang for your buck category. I've done my homework, and there is yet another point why Sony is the clear winner in lenses. If you speak to Nikon or Canon users you will learn the downside of expensive lens is the continuous re-calibrating. Sony (and Fuji) lenses don't require this period expensive maintenance, its all done through software. This is huge to me, lower maintenance is better and CHEAPER. Also check out the DXO Mark website. You will see that the Sony lenses are rated higher than most, leaving Canon in the dust. Go Sony!